With this cartoon I earned an incredible number of feedback through email and some even came by my desk personally to condolate. While thinking it over I could hit the nail on the head even better by adding a speech balloon on top of one of the figures saying "Not again..." as it wasn't the first business XMAS-Dinner like this. 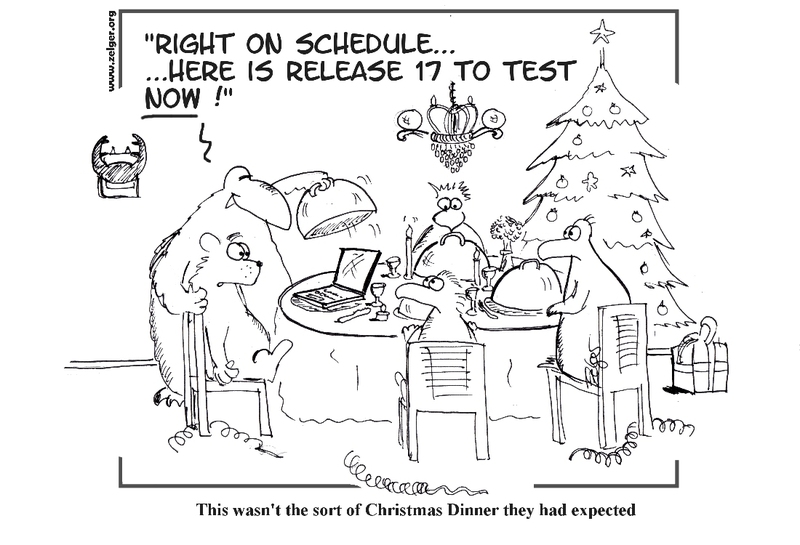 The last XMAS-Dinner or shall I say release plan was exactly of the same pattern. 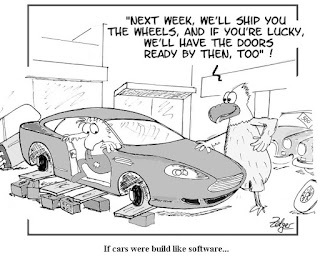 The fact that the OK team now organized a separate room for the testers and the deployment engineers gives me plenty of new inspiration for some follow-up cartoons. ThanX to Janette Rovansek who was so kind to publish the cartoon at STP Magazine newsletter. 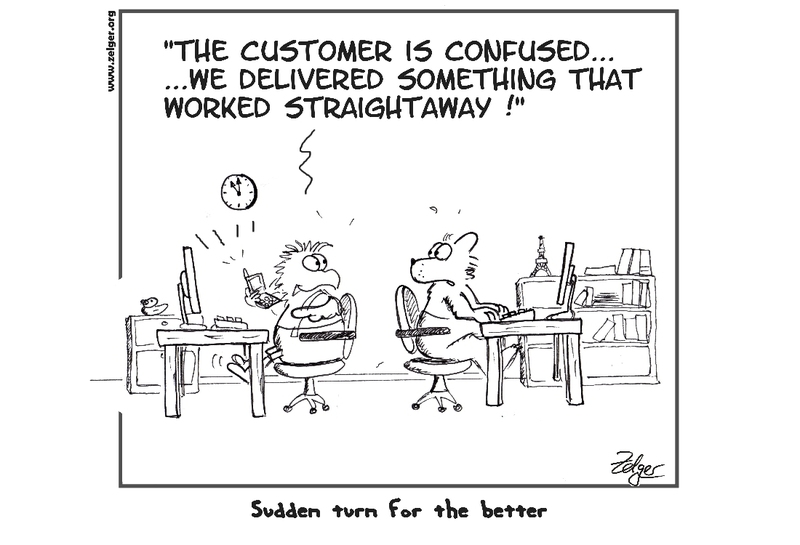 A P1 call on a Friday afternoon 4pm from a crestfallen customer after we deployed a new release the night before. 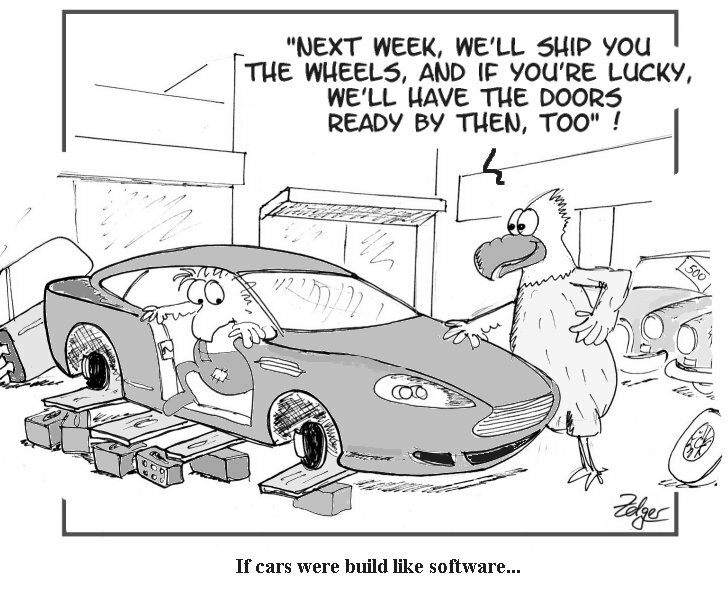 I asked myself, "how would it feel if we deployed a version that worked straightaway without any user running into troubles the day after we shipped the new release?" 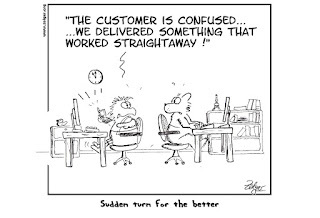 Without expecting it ever to happen, only a few months later, we got forwarded an email from a customer who congratulated us for the great achievement. He was happy because we delivered a piece of software which worked at first go. The customer was surprised, since he did not expect this from us, so he felt he needed to tell us how amazed he was. What does it tell me? It's obvious, that message was ambiguous. Did he really want to simply be grateful or did he want to tell us something else...? BTW. 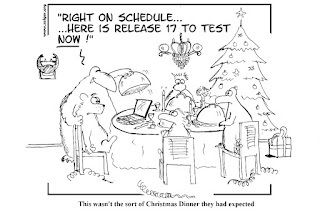 ThanX to Rob Lambert who was so kind to include my cartoon into the free eBook "A Tester is for Life, Not Just for Christmas".